Ok so really I wasn't on a blogging strike, I just haven't taken the time to blog! But now that I only have one child at home in the morning, I thought that I would try to catch up and get back into blogging. I'm not really sure where to even start and I feel a little overwhelmed by all that I want to put in here. 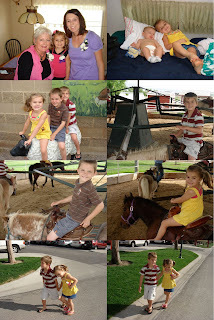 So I think that I am going to copy my sister-in-law Shayla and do a "note-worthy" post! 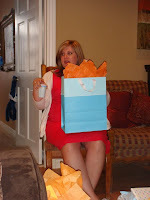 I guess I'll start back in April, when I had the opportunity to fly out to UT for my great friend Amelia's baby shower. I took Reddin with my of course since he was only 4 months old at the time and nursing. Mattie stayed home and was watched by my mom and my sister Stephanie. A big thank you to them for doing that, since Matt was working. Reddin was fabulous for his first plane ride, and we had a super fun time in UT. We went for a long weekend and we were also able to see Brett, Emily and the boys. Emily did a super cute photo shoot of Reddin (which I will post in another posting). 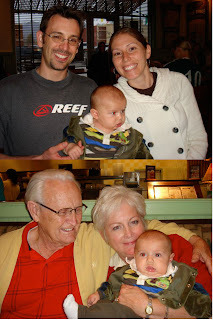 We were also able to visit with Ama and Kman and my brother Chris and Tia America. Reddin and I packed in quite a bit for such a quick little visit. After staying with Teresa until Kelly was released from the hospital, we headed on down to St George, UT to visit with the Brett Menzie family. Emily picked us up from the airport and we went to a super cute little water park. Mattie, Jonas and Makia had a great time getting wet. 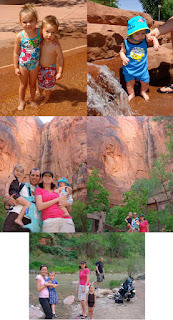 The next day we all went to Zions National Park for a day of hiking. We had a great time seeing some wonderful scenery and getting a good workout, (Matt more than me, since he had Reddin in the Baby Bjorn and Mo on his back! I would be lying if I said that I was totally fine with that set up. I was very nervous at certain parts of the hike to the Emerald Pools. I kept thinking if Matt just slipped even a little, I would lose my whole family!) All in all our trip to UT was a very eventful and fun one! Mattie finished up gymnastics. She took her lessons in the spring with her friend Jake from church. 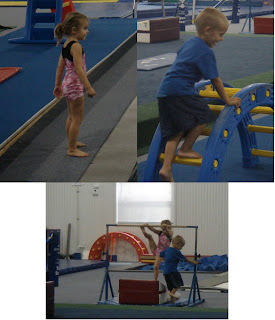 She really enjoyed her time in gymnastics each week. Matt played on in a interfaith baseball team with our Stake. Sometimes he would miss games because he was gone working, but when he was in town to play we would go and watch him. My sister Steph and Lochlan would go too, because her husband Greg was on the team as well. At this particular game Matt had two homeruns and Mattie the Cheerleader was going crazy cheering! Great job we had a blast supporting you! I did not attend my 10 year high school reunion last October because I did not feel like spending $200 to go. I was quite bummed about not seeing some of my really good friends from high school, especially the 3 girls that had been my besties during high school. Well this summer we had the opprotunity to go to dinner when 2 of them came into town, (1 of them lives here in Palm Bay). Steph came along cause she was always with us and she of course has been my very best bestie my whole life! 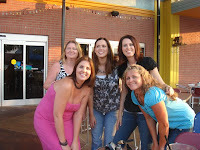 It was so fun seeing Lacey, Krista and Melissa, and I can't wait for our next little friend reunion! 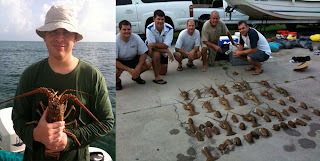 Matt got to go on his annual Lobster diving trip down to the Keys. He doesn't get to go and do guy things very often, so I am always supportive of him going down to the Keys each year. Plus, the spiny lobsters are SO yummy! This year he brought home 9 lobsters, that is the most he has ever brought back, the max is 12. I'm glad he had so much fun. I was able to attend Youth Conference this year with the young women of my ward. It was 3 days and 2 nights long, and was held at Stetson University. We stayed in dorms and I had a blast bonding even more with my girls. It was however hard to be away from Reddin for the first time! A HUGE thanks to my mom and sister for helping to take care of my kids, since Matt was actually in the Keys for the first part of Youth Conference. (This is another long one!) My nephew Brayden was turning 12 and more than half of Matt's family was going to be out in CA to help celebrate. Matt put in for a week of vacation and got it, so we were able to go out too! We took a direct flight out to LA and both kids were very good for the flight. We rented a car and met up with Matt's good friend from high school, Roger. 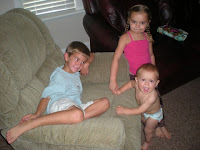 He works for Matel and gave both kids a toy, which of course Mattie loved. He also took us to Pinkberry for some AMAZING frozen yogurt. 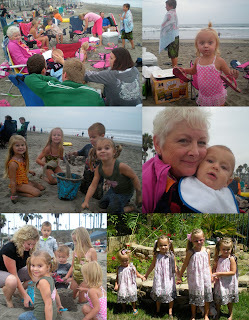 After leaving LA, we headed down to San Diego to meet up with Matt's family at the beach. Mattie was in heaven being surrounded by cousins and playing in the sand. Aunt Brooke was fabulous with the little kids and Mattie still talks about her! Reddin on the other hand was very tired from a VERY long day of travel. We headed back to Matt's sister's home to get some sleep. Mattie, Izzie and Lexie decided to be teenagers and pull an all nighter with their slumber party! Seriously Mattie got up and left FL and 4am (Eastern time), and was still up in CA past midnight (Western time)! I honestly don't know where she gets her energy! The next day we went to a vineyard so my wonderfully talented sis-in-law Emily could take photos of Mattie and Reddin. I really wanted the photo shoot for Reddin because he was turning 8 months and we had gotten pictures taken of Mattie at 8 months. I will post those pictures in there own post because there are quite a few! Once again Emily did a FABULOUS job! Later that night all of the adults got to go on a group date for some sushi. It was so fun to get away without the kiddos and we were very grateful to Kenzie for taking such good care of Redd and for Bray for taking such good care of Mo. On Sunday Brayden was recieving the Aaronic Preisthood and being ordainded a deacon. Matt's father drove down from UT for the special day and it was his first time meeting Reddin too. It was a good time seeing so much family! We left that night with Teresa in her RV. 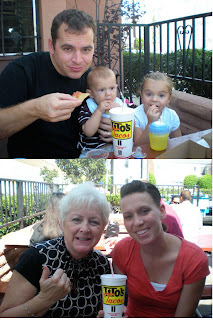 We spent the night in the LA temple parking lot, and the next morning woke up and headed over to Tito Tacos. This is a favorite place of Matthew's, having grown up eating there quite a bit. He actually took me there one time before and I had not cared for it. But this time I really enjoyed it. The salsa and chips were especially my favorite! After Titos we headed over to La Canada to pick up Kelly from his daughter Lori's house, or should I say mansion?! The house had an awesome theater and an amazing pool, which of course we had to take a dip in! Mattie had a wonderful time playing with all of the super fun girly things. We were going to leave that afternoon, but decided to spend the rest of the day and night there. A big thank you to Lori and Glen for putting us up for the night! 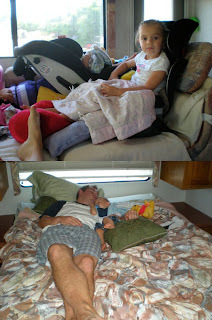 We took off the next morning and drove with Teresa and Kelly back to UT in their RV. Mattie and Reddin were really good for the long drive to Ama's house. We got to Teresa's house late that night and went straight to bed. The next day Teresa drove us up to SLC to the Paschal's house. Once again we had a wonderful time playing with our friends. Mattie and Taylor were joined at the hip, and I had so much fun with Adrian. We stayed up late watching movies and eating junk, laughing and talking! Oh how I miss her! Also while we were in SLC for that short time, we were able to get together with our friends Amelia and Phil and meet their brand new little guy Max. 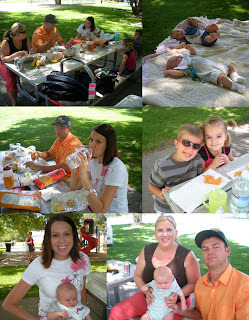 We met for a picnic in the park and it was so fun spending time with them. I am beyond excited that Amelia is a mommy, and her little man Max is just too cute! Congratulations again Phil and Amelia! We flew home the next day and that was the end to our very full and eventful week of family vacation. I was just thinking it had been a while since you posted on your blog (though I'm not one to talk). I'm sure that was a lot to recap but it was fun to read. Yeah! You're back! I like your 'new do' for your blog header:) Izzie is still posturing---and making plans to see Mattie again! That was a fun weekend even if it was short! No wonder you haven't blogged - you've been traveling everywhere!!! Fun! Now THAT's a recap! Love the new blog look & reading and seeing what your cute family has been up to. We'll be thinking of you when we have our Halloween dinner. first, I so know that girl from your school...I think it's Lacy (strapless dress)? and oh my gosh, isn't Lori's house AMAZING!!! so many trips, how fun!! So glad you posted - I've been lonely for grandchildren pictures!